"Paul and I met you during our recent excursion, Art Tour Across America, during Jan- March 2011. Our meeting many exceptional artists on this tour has resulted in our hosting the Tour of America: Artist Invitational exhibit opening Labor Day Weekend and remaining on view until Oct 3, 2011 at our gallery, Cortile Gallery, in Provincetown, MA. For the exhibition, Michael has sent two of his sculptures: The Poet and Surf Play, and three paintings: Homestaed in Summer Light , Autumn Delight II, and Nestled In. The Building of “Courage”, is a diary in text and photography that takes the reader step-by-step through the building of the sculpture “Courage”. A sculpture standing in tribute to those who have, who are and who will battle Cancer. First published in 2009 as a 13” x 10” full color hardcover coffee table book, Tieman signed a deal for Amazon.com to print and distribute his paperback version of his book. The paperback The Building of “Courage”, is an 8” x 10” format, printed in full color and can be purchased at amazon.com for $29.95 plus shipping. Shopping at Amazon.com is easy, go to his page. This piece I started in June in the Haystack Gallery as part of my "Tieman on Tuesdays" summer sculpting demo program. She is completed now and local jeweler Sharon Amber has designed a special necklace for her. A new stone sculpture completed "Venus-Abstracted"
This was a gorgeous piece of stone, alabaster but a raspberry color. This is the stone piece I did for the 3rd Stone Sculptor in the "Hands of the Artists" collection. As I was carving the stone, the veining inside revealed its self and I altered the piece to take advantage of the colors and the veins. This turned out so well, it may be added to my personal collection. Just in case, I am carving a replacement - my first piece of marble. A new piece I have waited five years to start ... "The Elements". Five years ago I decided I wanted to do a special piece of the four classic elements; Earth, Wind Fire & Water. Two things have stopped me. I have begun two new sculptures, the next artist in the "Hands of the Artists" collection. I have started working on my newest "Hands of the Artists" piece, The Jeweler. At Haystack Gallery in Cannon Beach. We have started a summer program called "Tieman on Tuesdays" where every Tuesday this summer from noon to 3pm I will be sculpting in the gallery. You can stop in anytime and see the progress I am making on the sculpture, but during the three hours on Tuesdays you can see me actually sculpting in clay. Check out this link to my journal http://www.haystackgallery.com/jeweler10web.htm where you can keep up to date with my progress. My goal is to complete The Jeweler in clay by the end of the summer in time for the Sculpture Exhibition in September. Artist Michael Tieman has completed the 18" clay master of 'Courage' to be cast in bronze and the newly completed butterfly necklace from 'Courage' cast in solid silver. 'Courage' is a bronze sculpture standing in tribute to all of those who have, who are and who will battle Cancer. Up to fifty percent of the proceeds from each sale will be donated to Cancer Support Services. Courage website. On July 29, 2009 at 2:30 pm in Akron, Ohio, a three foot tall “Courage” sculpture standing in tribute to those who have, who are, and who will fight Cancer is being donated to the new Summa Health System's Jean B. and Milton N. Cooper Cancer Center, Akron City Hospital, Akron, Ohio. The first 36” sculpture “Courage” in the limited edition has been purchased by Connie's husband of 25 years, John Drotos, and he is dedicating it to the Cancer clinic where Connie had treatments for six years. With the purchase of “Courage” there is also a cash donation of $5000 which goes to the Cancer Support Services department of the Cancer Center . Tieman will unveil the completed 36" bronze of "Courage"
May 1, 2009 at 4:00pm at the Cannon Beach Chamber of Commerce building. Sunday November 9, morning reception will begin at 10:30 where you can meet resident sculptor/painter Michael Tieman as he works on his latest sculpture "Courage" in Haystack Gallery from 11-3:30pm. in Cannon Beach, Oregon. August 1-31. Artist Reception Saturday, Aug. 2 starting at 3pm. The exhibition consists of a dozen paintings, and ten bronze sculptures. Pacific Northwest painter and sculptor Michael Tieman is finishing up his next two sculptures in his Hands of the Artists collection; “ The Poet”, and “The Painter.” For his exhibition August 1-31 at Haystack Gallery in Cannon Beach, Tieman will unveil the two new pieces thus completing the first set in the Hands of the Artists collection which includes; “The Glassblower”, “The Stone Sculptor”, “The Painter”, and “The Poet”. 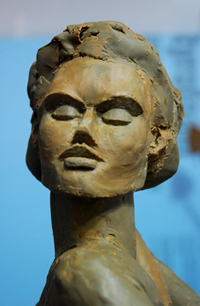 “Each year I will release several sculptures in the Hands of the Artists collection. Each sculpture will be released in a limited edition of ten. The Hands of the Artists collection will include the first set: “The Glassblower”, “The Stone Sculptor”, “The Painter”, and “The Poet”. The other sets will include; “The Weaver”, “The Photographer”, “The Potter – Wheel”, “The Carver”, “The Potter – Raku”, “The Jeweler”, “The Dancer”, “The Clay Sculptor”, “The Musician” and “The Blacksmith”. The Hands of the Artists collection is unique in that is a collaborative creation of two artists, each producing a one of a kind single piece of sculpture.” says Tieman. 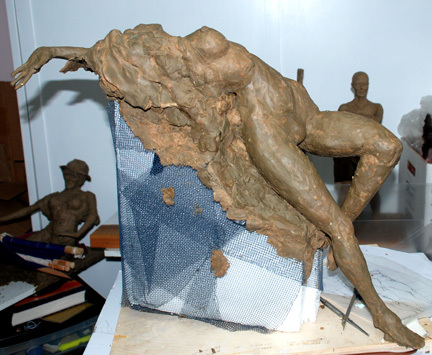 “I sculpt the figure of an artist at the moment of them creating, and cast that figure in bronze. Another artist chosen for the piece then creates an original second art piece which is the completed creation piece.